This dish is delicious, healthy, hearty, requires few ingredients and just a bit of time. Forge ahead this cold season with your Butternut squash dish by your side and allow food to be your medicine this fall. School is in full swing, which means cold season has already reared its ugly head. Elora and I were lucky enough to get sick this past week and by luck I mean, the bad kind. Despite the fact this is my second offspring and I should be more laid back when it comes to colds, hearing an infant cough is a rather scary sound. I immediately thought she had whooping cough, so my wonderful hubby took her to her pediatrician the same day. Better to humor the wife than insinuate she is crazy. Yes, this is what Jewish mothers do, they fear the worst and hope for the best. Luckily, Elora was diagnosed with a minor virus and we were sent home with some homeopathic vapor rub and ear drops. The incident made me think of Dr. Aviva Romm and her belief about building immunity year round; beginning with one of Hippocrates famous quotes, "let thy food be thy medicine and medicine be thy food." Dr. Romm even offers an online course to help educate families about building immunity for the entire household. I have signed up for the online course, but since I have only just begun, I can't honestly recommend it - though I do expect great things. Dr. Romm began her career as a midwife and herbalist, and later received her MD from Yale. She utilizes both eastern and western medicine, a practice I can appreciate since I believe both serve their own purposes depending on the situation. One of the first things Dr. Romm will mention when it comes to building immunity is, eating produce associated with the current season can be most helpful. For instance, in the summertime, it is believed eating lots of cooling fruits and summer veggies is best for the body, while during the winter, the body appreciates warm comforting seasonal produce and heavier proteins. This butternut squash recipe is one to include in your arsenal, a nutrient packed punch for those invasive germs. I picked up our squash from our local farmer's market. If you live in an area where your farmer's market is closed for the season, frozen pre-cut squash will work fine. I found the greatest challenge with this recipe was the restraint required to forgo adding additional ingredients. I was tempted to throw in brown sugar, roasted garlic, shallots and cumin, but alas I was able to stop myself. Like going to a sale at Macys, I had to talk myself down, "don't do it girl, you know you don't really need that now..." Somehow, reprimanding my conscious self seemed to have the affect I was seeking, I put down the garlic and simply walked away. Restraint can be hard for a cook, home-cook or otherwise. We want to wow our consumers with a variety of flavors, but restraint as I am learning, is a true sign of respect and understanding of the food to be prepared. When you only have a few ingredients, such as indicated in this recipe, it is important to make sure your ingredients are of the highest quality. If you have a hard time removing the peel from your squash, simply heat your oven to 350 F, pierce your squash with several fork punctures and allow to cook for 30 minutes. Remove from oven and allow to cool. The skin can now be removed easily with a pairing knife or a vegetable peeler. Heat your oven to 400 F. Line baking dish with parchment paper or use a non-stick spray. 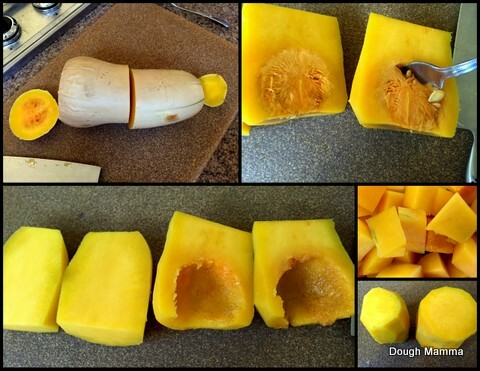 Cut squash into 1 inch dice. Place in a medium size bowl. Melt your butter and pour over your diced butternut squash. Mix with your hands to ensure even coating. Season liberally (to your taste) with Salt and Pepper. Bake for 1 hour, gently folding mix at the 30 minute mark, to ensure even browning. Remove from oven, toss with toasted nuts, finely chopped parsley and lemon zest. Serve while warm. Can be easily reheated, so feel free to make this a day ahead. My older one got sick this morning. Dropping like flies. Vitamin D walk.